Few thought American Mariel Zagunis, the last athlete added to the U.S. Olympic fencing teams roster, would take the gold medal in the premier womens sabre competition at the 2004 Athens Games. But Zagunis final winning touch against Xue Tan of China was a fitting end for a historic victory on two frontsfirst, for the U.S. fencing team, which hadnt won a gold since 1904, and second, for womens sabre, a discipline making its Olympic debut. Zagunis wasnt the only U.S. woman sabrist to excel. Sada Jacobson, ranked number one in the world entering the Games, brought home the bronze medal, and her younger sister, Emily Jacobson, was a strong contender. Sabrists from Russia, Poland, China, Romania, France and Italy fared well in Athens, leaving their marks on this historic moment. For the first time, women had competed as Olympians in this historically male-dominated sport. Women specializing in sabre have not only learned to hone the lightning-fast reflexes and sharp, exacting intellect their sport requires, theyve also had to become exceptionally thick-skinned to overcome the many obstacles that preceded its inclusion in the Olympic Games. Fencing is one of the original modern Olympic sports and has been included in every Olympic competition since 1896. However, Athens 2004 was the first time women competed in sabre, the fastest of fencings three disciplines. 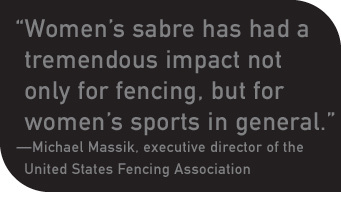 In 2002, when the International Olympic Committee announced that womens sabre would be included on the roster for the 2004 Games, anger and protest ensued within the fencing community. The addition of individual and team events in womens sabre meant that fencing, which is allotted only 10 medals total, now had 12 events. Two events would have to be rotated out of the 2004 Games, and the Fédération Internationale dEscrime (FIE) made a controversial decision to keep the mens events intact and eliminate two womens events for 2004: team foil and the newly proposed team sabre. Under the banner of gender equality, women fencers lost womens team foil to gain womens individual sabre, while the men saw no changes. It was a rocky start for the new discipline, since many of the women who had trained for the team foil event saw their Olympic hopes dashed in an instant. But nothing legitimizes a sport faster than its inclusion in the Olympics, and Athens was a golden opportunity for womens sabre to gain the recognition it deserved. 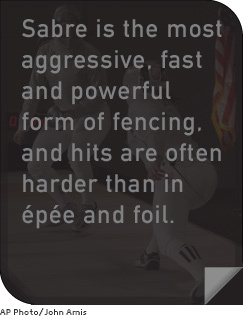 Sabre is the most aggressive, fast and powerful form of fencing, and hits are often harder than in épée and foil. Derived from the sword used in combat by horse-mounted cavalry, the sabre is aimed at any area above the waist (since it was considered poor form to kill your opponents horse), including the arms and head. Touches are scored with the weapons point (as in épée and foil, and also with the side of the blade, in a slashing or cutting motion. Similar to womens tennis, which differs from mens serve-and-volley game, womens sabre is slightly slower and involves longer exchanges than mens sabre. Characterized by fast, ballet-like motions and unbridled athleticism, sabre has captivated audiences (particularly those new to fencing).